Peculiarities: The family with two young kids, a baby and a elderly woman with heart problems were deported without meeting medical needs nor the right to apply for asylum. The pictures are from the place in the jungle, where they were found. 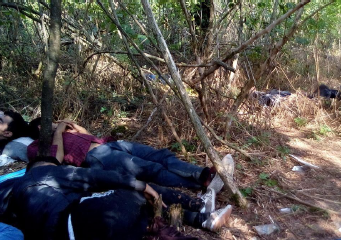 At the very beginning of September, they were 8 adults and 3 children : the police found them in the jungle. The pictures we have are from the place where the police found them. They explained their situation and journey to the police officers : they had been waiting for a car during 3 days, they are hungry. 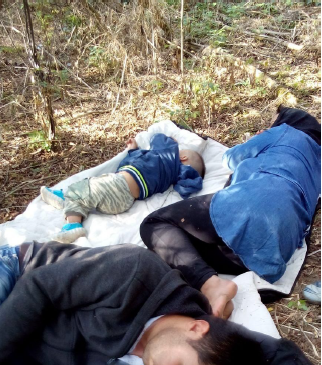 They beg them not to be deported, that they had a baby, that they wanted to ask asylum in Croatia. She also explained that her mother has heart problem. But the police didn’t listen, and the police officers called for more police cars to come. No food was given to them. They were driven back to Serbia, and dropped at the border around midnight. It was the 2 nd time they were pushed back.